How to add Images to tasks directly from google. We have recently added the ability to add images directly from google into your price book. Simply head to a task record and click on the images tab. If you click [Upload From Google] you'll be able to search for google images and then upload them directly to the task. As you can see in the picture above, you'll be able to add any image that you see fit to the task. After you find the image that you think is appropriate for the task, simply click on it and an additional prompt will appear. This additional prompt will confirm that you'd like to use the image that you've selected. Try to make sure you pick one that's the proper size. After that, you'll be greeted with an additional prompt. This prompt just explains that you'll need to crop down your image before you can add it to the task. After you click that button, there will be one final prompt. In this last prompt, you'll be asked to crop your image to the correct size. 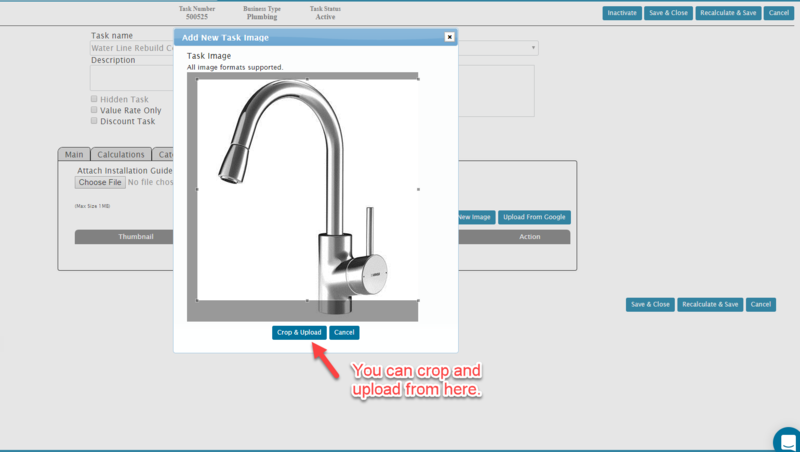 After you've cropped it to the correct size, go ahead and click "Crop & Upload" and your image will be added to the task.